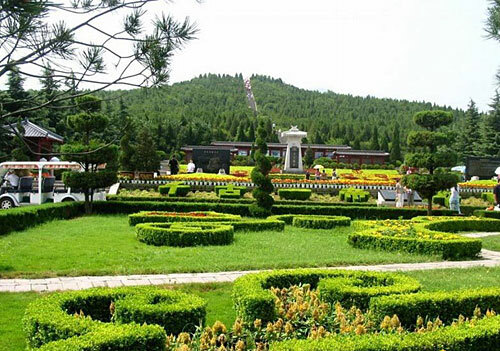 The mausoleum of Emperor Qinshihuang (the first Emperor of the Qin Dynasty) (秦始皇陵) is five kilometers east of Lintong County, 35 kilometers from Xi'an City in Shaanxi Province. To its south is Lishan Mountain and to the north is Weihe River. It is the biggest imperial mausoleum in ancient China. A distinctive characteristic of the tomb of Emperor Qinshihuang was that it had two city walls, one interior and one exterior. The shape of the tomb was similar to the Chinese character "Hui," but somewhat longer from north to south. The rectangle formed by the exterior wall was 2,173 meters from north to south and 974 meters from east to west, making it more than 6,000 meters around the base. There is some description about the underground tomb and its layout in the Records of the Historian. Inside the tomb were palaces and burial places of all the high officials of the Qin. Automatic hidden arrows protected the tomb from robbers and looters. A belt of quicksilver poured in a ditch around the tomb looked like a protective river. - Hours: 8:30 a.m. - 5:30 p.m.